Exterminate! 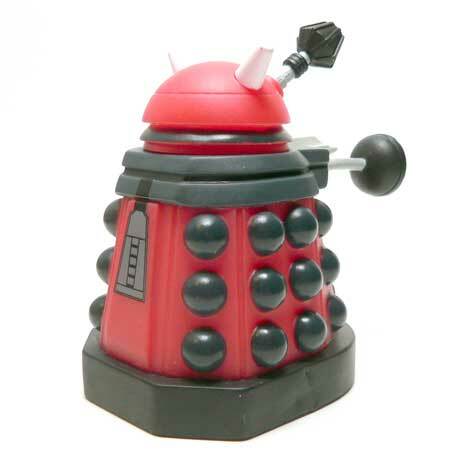 I couldn’t have the Doctor running around with at least one Dalek. I ended up with two. I was actually trying for a Tardis and a Dalek, but I’m not going to complain. I was trying to feel for something that was big and bulky in the Doctor Who Titans boxes. You can almost tell these guys by weight alone compared to the humanoid characters. Mrs. Nerd was pretty sure she could tell one of them was a Dalek cause it was narrower than long at the base. Both of these guys are the same mold. One is a Drone and one is a Strategist. The only difference here is the base color. 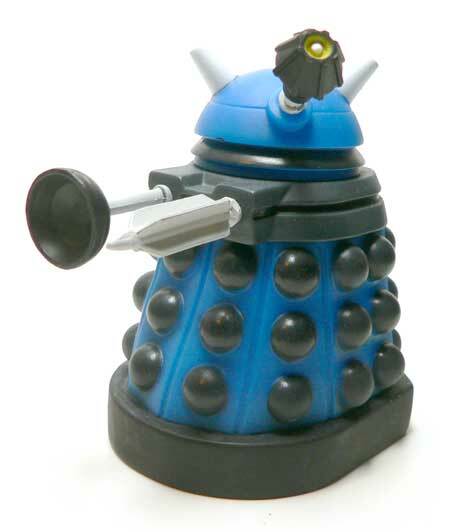 Compared to the rest of the line, the Daleks are a lot less stylized than the other characters. Sure they’re squashed and micro-ized. There is no mistaking what they are however. Surprisingly, there is even a little detail of an access panel painted on the back. It’s a neat detail that wouldn’t have been missed, but really adds to the figure by being there. 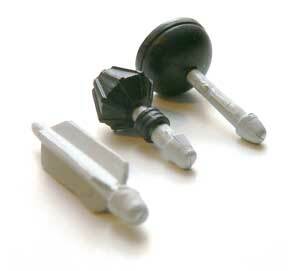 The plunger, arm and eyestalk are all separate pieces. They are all a bit overscale. Well sculpted, but overscale. My one complaint about these figures is with their accessory appendages. They just don’t want to seat real well. The rotating head isn’t coming off. However, sneeze real hard an you will unseat the eyestalk. I might use some glue to permanently attach these at some point. I do have one other small complaint, but it’s more of a manufacturing defect. 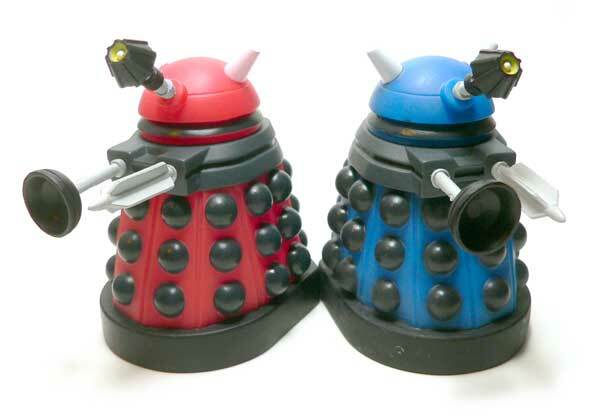 On the base of the red one, there is a small molding blemish on the right side. It’s not terrible, but once you know it’s there, your eye is kind of drawn to it. I still am impressed by the quality of this line. It’s obvious that the folks behind it are fans of the show and have wen the extra mile to put out toys that give fans something they will be happy with. 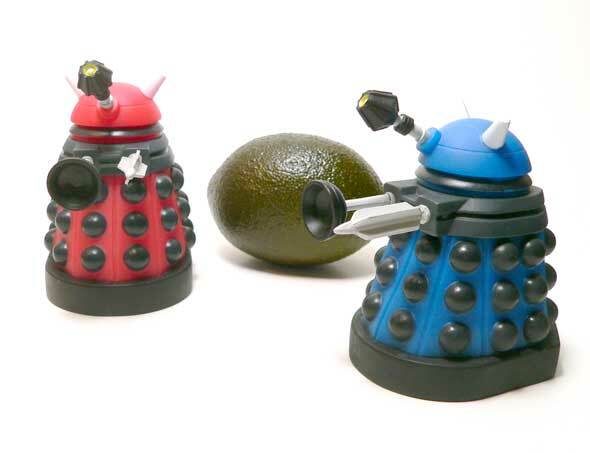 While there are a number of Skittle colored variations of the Dalek, it’s a great figure, and one that I’m glad to have sitting here on my desk.